Ready to skillfully bang out some great beats on the drums? 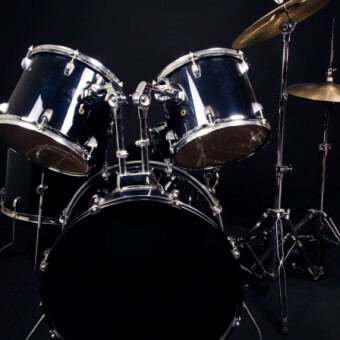 At DeAngelis Studio of Music, we have the most professional drum lesson room and instructors in the Merrimack Valley. We have a full size acoustic and electronic drum kit for our students to use. Our drum instructors teach rock, metal, jazz, funk, blues and many other styles. Since drum language can be complex, our instructors will challenge any drummer with a wide variety of technical exercises designed to improve your speed and comfort. All drummers bring in their favorite drum parts to learn in their lessons and theory is encouraged. We have many drum students who play in local bands, be it in rock clubs or their local churches. You do not have to purchase a drum kit to take lessons — beginning students can learn with a drum pad and sticks for only $25.00. Students can use our drum set at their lessons and do not have to bring anything except their drum sticks and a notebook. Ready to get started with the best in the industry? We have some of the most sought-after drummers in New England, teaching beginner to advanced lessons. Their available spots fill-up fast, so contact DeAngelis Studio of Music to reserve your lessons! Don’t forget to learn a little about our great drum & percussion teachers. Click the photos below to get a taste of their experiences, skills, and passions. Craig’s vast live experience includes various forms of music, from rock to jazz, fusion to funk, to free improvisation. Aaron’s experience includes working with kids and adults at all skill levels and genres, and teaching is truly his passion. Our newest instructor Nick has a unique talent of adapting songs so students can learn and be motivated by some of their favorite music, even at beginner levels. Unique and energetic, Sarah helps students with singing technique, confidence, and range, and will adapt lessons to individual needs.